The shorts are shorter and tighter than they would be by the turn of the millennium. The sunglasses – are those Revos, Vuarnets, or Hobies? – are rounder than they would be once the Oakley wraparound sunglass craze came and went. The duffles look like something you might take to a Richard Simmons workout session. 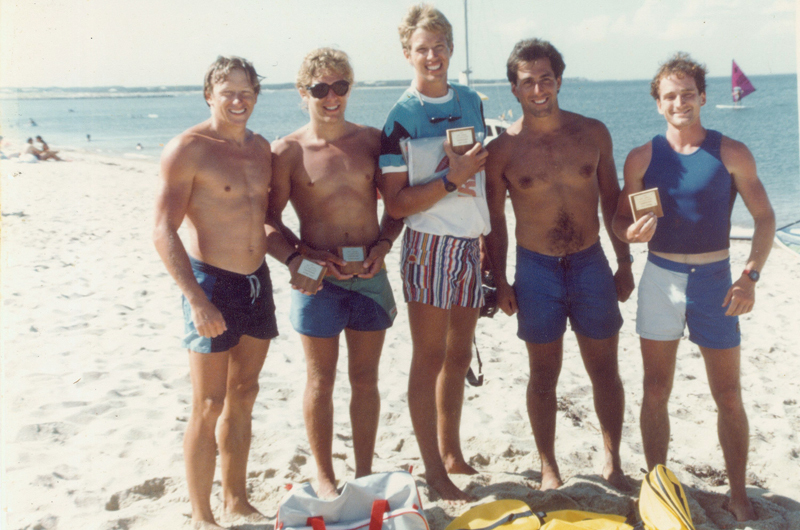 The event was the Ninth Annual Northeast Windsurfer Championships held off of State Beach, which explains the plaques that all but one of the athletes are holding. Like short shorts and big hair, windsurfing itself lost ground in the new millennium to traditional surfing, stand-up paddleboards, and, above all perhaps, kiteboarding. But with men-hems rising and supply-side hocus-pocus back on the table, who knows? It might be time to polish up your backwards rail ride. From left to right they are: Frank O’Brien, Everett Bramhall, Rick Floyd, Bob Hayman, and Andrew Moore.